Spring is full of beauty, blooms, and in the month of April, poetry. It's National Poetry Month again! 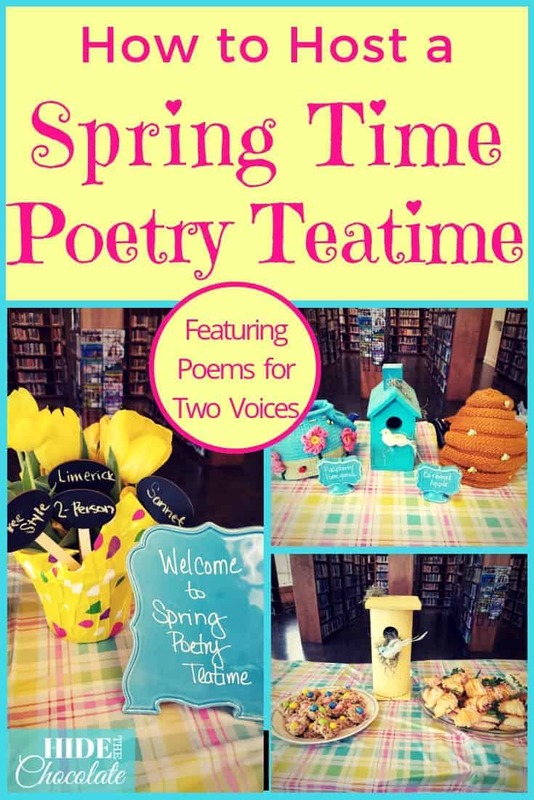 What better way to celebrate the month of poetry than with a Spring Time Poetry Teatime and poems for two voices? 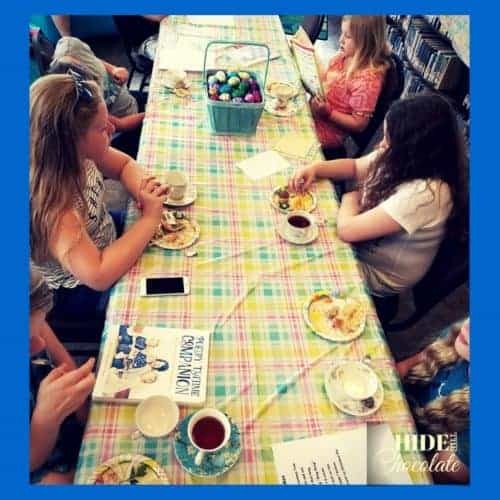 For the last year, a small group of homeschoolers has been meeting at our local library for Poetry Teatime. Each month we have a theme, tea, snacks, a poetry activity, and most importantly, the sharing of poems. This month our theme was Spring Time. The children were encouraged to bring poems that celebrated Spring. These could be original works or by celebrated authors or even by not so celebrated authors…whatever took their fancy. Our tulips this month included some of the types of poems we have discussed recently. The “Pixie Dust” of every Poetry Teatime is the atmosphere. I believe in going over the top. 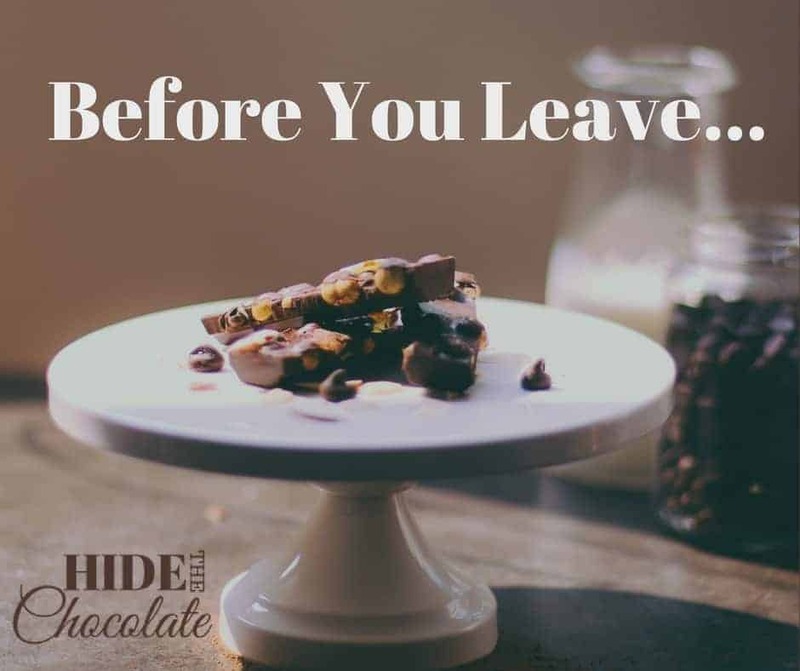 There is no such thing as too much when it comes to adding “Pixie Dust” to your day. I decorate the library to match our theme, and we always use china teacups (I get mine at vintage stores and estate sales. Chips are okay. They add character!). 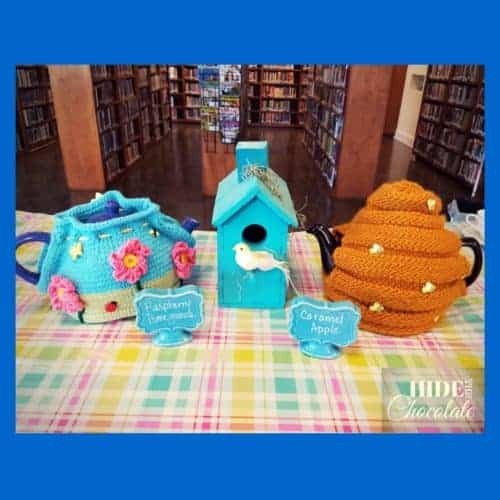 Tea cozies to match the theme are beloved by the children. This month we had a Spring flower cozy, but my favorite was the beehive. As much as I love my Brown Betty teapot , it is not the most attractive teapot. The tea cozies add some fun to my British teapot, and they do a fantastic job of keeping the tea warm. 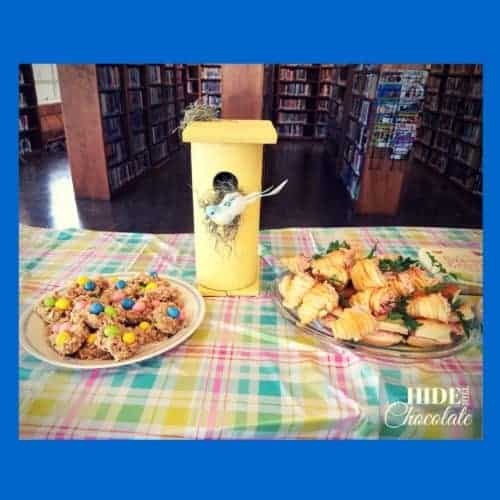 Snacks are a HUGE part of a successful Poetry Teatime. This month one of the mothers brought ham salad sandwiches decorated to look like carrots. Adorable and delicious! The kids loved the bird’s nest cookies, too. And, seriously, how amazing is the bird’s house my 93-year-old grandfather made for me? I love National Poetry Month! It gives me an excuse to have fun with poetry (as if I don’t do that all year! ), but it also means that there are lots of fun poetry events and contests in which to participate. Last month we talked about HSLDA’s Poetry Contest. Some of the children decided to take part in the contest and brought their poems to share with the group before they submitted them for competition. My favorite part of poetry teatime is listening to the children read their poems. Not only are they developing an appreciation for poetry, but they are also developing public speaking skills. Children who were too embarrassed to speak out at the first few teatimes, now bring multiple poems to share. One of our newest poetry books is this Scholastic Month-by-Month Poetry book. My youngest likes it because she can pick out books by the month. 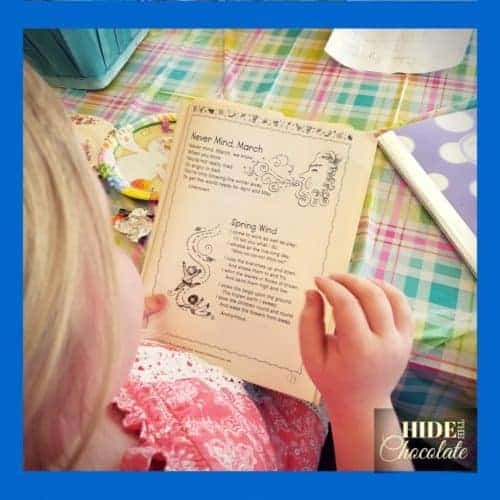 This month she chose a cute poem called Spring Wind to read to her friends. 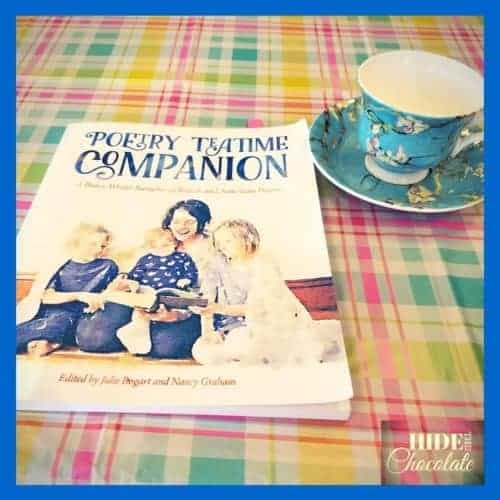 Another favorite of ours is Poetry Teatime Companion by Julie Bogart of Brave Writer. This poetry book is grouped by seasons and is full of beautiful artwork. This month I introduced poems in two voices to the children. 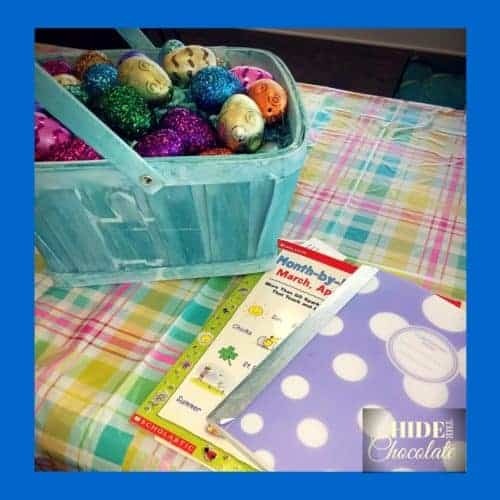 These are great fun for groups. The kids volunteered to read poems with their friends and soon realized that it was more difficult than it appeared on paper. I started with this great book of poems in two voices. This particular book is about insects and went along with our nature and Spring theme. Here are some other great resources for poems in two voices or more. 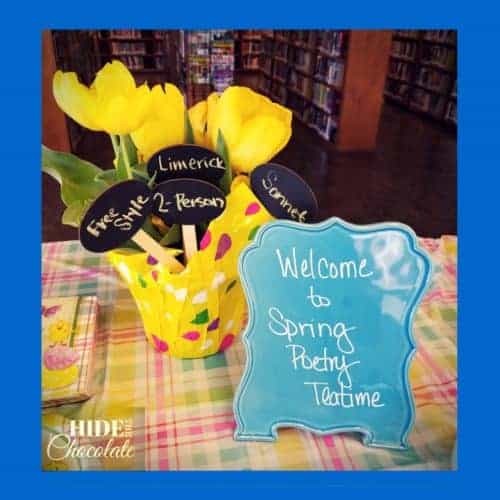 No matter your theme or group size Poetry Teatime can be fun for all ages. We have found that library Poetry Teatime also satisfies some of our cravings for social interaction. What are some of the ways you celebrate National Poetry Month? 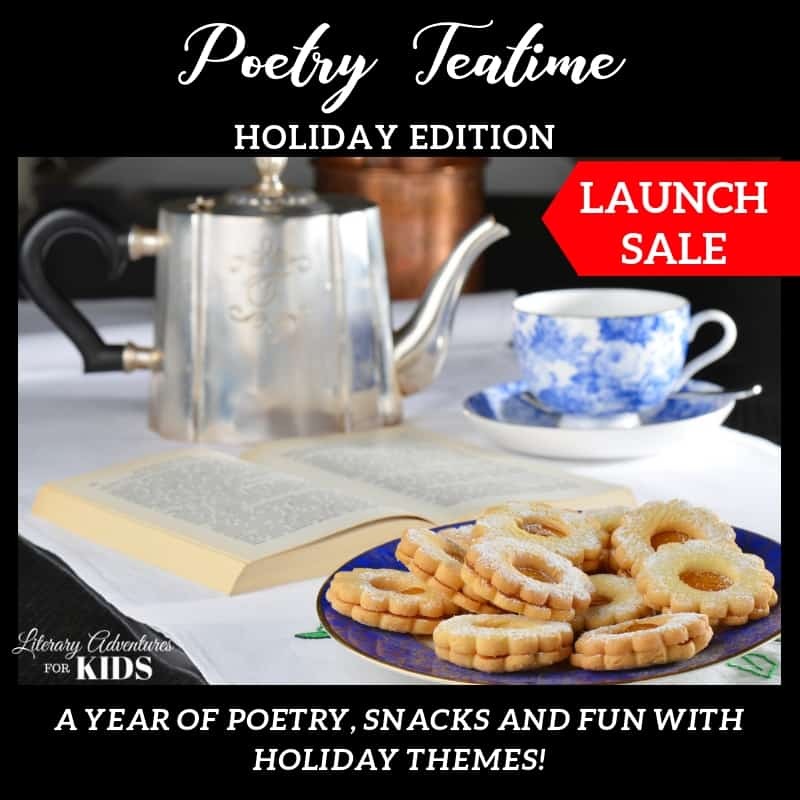 I love the idea of poetry tea time, but I can’t picture my kids sitting and being quiet long enough! I think part of what helps my crew is that they can eat snacks while someone else is reading. Mine also love to share poems (especially Shel Silverstein) so we take turns reading aloud. This looks like so much fun! You had some really cute ideas. I know the poetry flowed! 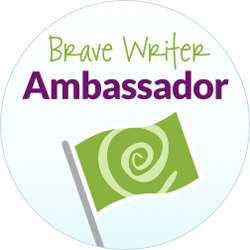 (I was a Brave Writer Mom, too!) Thanks for sharing your pictures and great literature ideas! Sounds like so much fun. I’ve always loved homeschool literature themed stuff the best! 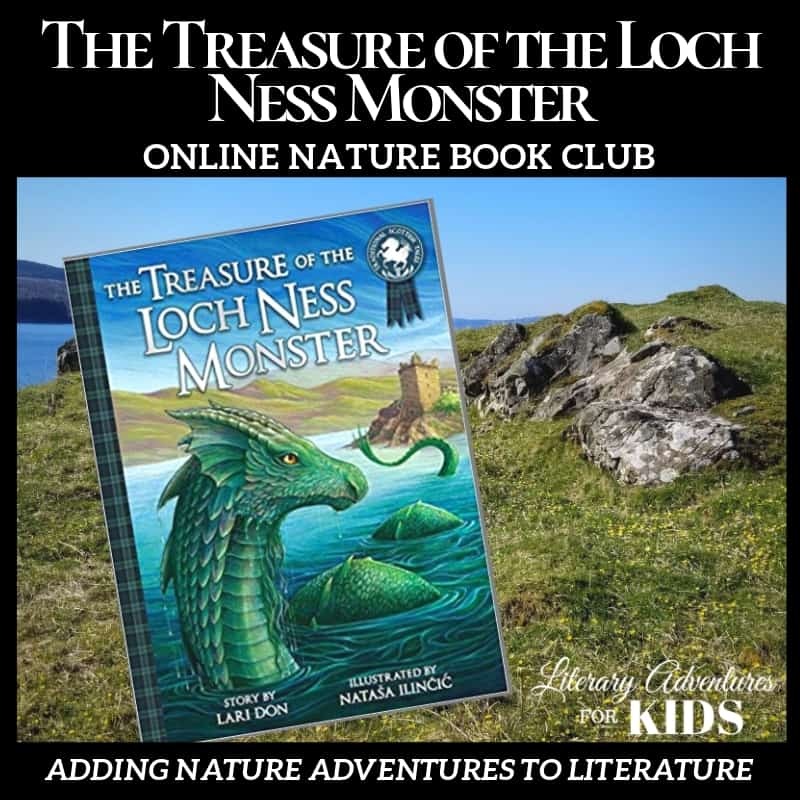 🙂 Thanks for sharing at Literacy Musing Mondays. This sounds so fun! I used to love poetry as a kid. I also love seeing homeschool programs as we are planning on homeschooling! Thanks for sharing on This is How We Roll link up. Our favorite part of poetry teatime is spending time with other homeschool families. I love this idea! I’m always looking for ways to interest my kids in poetry. Poetry Teatime is one of our favorite things!